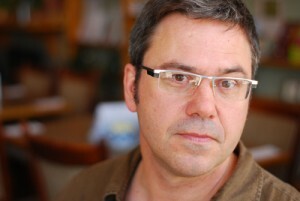 Eric Coates is the artistic director of the Great Canadian Theatre Company (GCTC) in Ottawa. He was the artistic director of the Blyth Festival from 2003 to 2012. He has directed for the Blyth Festival, Thousand Islands Playhouse and Drayton Entertainment. He is extremely proud of the Blyth Festival’s new play development record during his tenure: twenty-eight world premieres, thirteen scripts published, and two finalists for the Governor General’s Award (Reverend Jonah by Paul Ciufo and Innocence Lost by Beverley Cooper). As an actor, he spent four seasons with the Stratford Festival and has performed in regional theatres in Ontario, New Brunswick, Nova Scotia and New York. Eric is the President of the Professional Association of Canadian Theatres (PACT). What is it about this day that is unlike any other day in the history of these characters? Has the story earned the right to be told? That sounds pompous – or pedantic, at least – but these are essential questions. Inevitably they are answered by dramatic action. If a playwright shoots the story out of a cannon, I am interested. If the playwright wanders and reflects, I am not interested. Also – the playwright must demonstrate some understanding of the company’s aesthetic. When I was at the Blyth Festival, I rejected a lot of work because it simply could not have been produced in that environment without inflicting major damage to the relationship between the company and its core audience. How important is the workshop process in developing a new script? How many is too many? Workshops are overrated. They are useful, but far too often they are conducted without a clear set of objectives. I have been horribly guilty of letting this happen for years. I support a workshop that is led by a dramaturg or director/dramaturg who has established a set of objectives prior to the event. The playwright needs to be involved in creating these objectives – and the two artists must agree on what they are looking for. “I just want to hear it” is not a good reason to put valuable resources into this stage of development. Consider the expenses that theatres commit to workshops while the playwright works for peanuts. I would rather increase the commission fee and see more drafts of the play. No. There is a financial imperative to keep the cast size down to four actors. And there certainly is a movement toward the 90-minute one-act, but none of this is ideal. In my experience, people respond to artistic excellence. Length and cost are no object when the work is brilliant or intriguing. From a practical standpoint, that is all that matters. I prefer a script that is formatted with character names in the left margin. I do not like a centre-justified format. Keep stage directions in italics or bold, please. As long as it’s clear, I’m happy. I have mixed feelings. Leanna Brodie makes me laugh out loud with her stage directions. Ken Cameron makes me cry in despair and throw his script across the room. That’s an exaggeration, of course. Ken and I have talked about this and he believes that by creating an impossible stage direction (ie, hand-in-hand, they walk through the field of tender corn shoots, disappearing as silhouettes into the distant hills) Ken wants me to understand the essence of the environment, but he clearly knows that I cannot re-create it physically. Detailed stage directions are essential if your story requires specific physical action. Too many unnecessary stage directions give me an uneasy feeling about the playwright’s confidence in the text. Too many stage directions. Navel gazing. Exposition – I receive a lot of plays inspired by historical incidents in which the first three scenes are devoted entirely to exposition. There is no topic worthy of poor storytelling. Physical action on stage cannot be edited the same way as film. I see more and more naturalistic scripts that include wordless scenes that cannot be achieved effectively on stage. Physical theatre can achieve these things, but not within a naturalistic play – unless the playwright is prepared to switch styles or incorporate a surrealist or physical aesthetic from the outset. Our Town. It breaks every rule that we impose on playwrights and it still provokes a profound emotional reaction in contemporary audiences. This is a shocking choice, I know, but I am talking about importance, not my personal favorite. It moves people and that is important. Fill in the blank. I wish people would stop telling playwrights to ___. I am excited because I am working in a new environment where I can expand the palette considerably. Suddenly I have access to a much more diverse and adventurous audience. It’s particularly exciting to see young playwrights like Hannah Moscovitch getting so many productions – her work is unpredictable and vibrant. In my estimation, the established heavyweight champ in Canada is Michael Healey who also provides constant surprises in his writing. It is always active, devilishly smart, and politically engaging. I am discouraged by the growing number of solo shows that are purely reflective in nature or work that is too reliant on technical support. Do your research on a company before making a pitch. Go see their shows, if possible. Write what you know. You may not know what it is to be a Prime Minister, but if you put that character into a situation that you understand, you have a better chance of achieving brilliance. Watch your peers’ work with generosity. Watch it with an eye for what is right with it, instead of what is wrong. Learn about your own writing by committing to this approach.